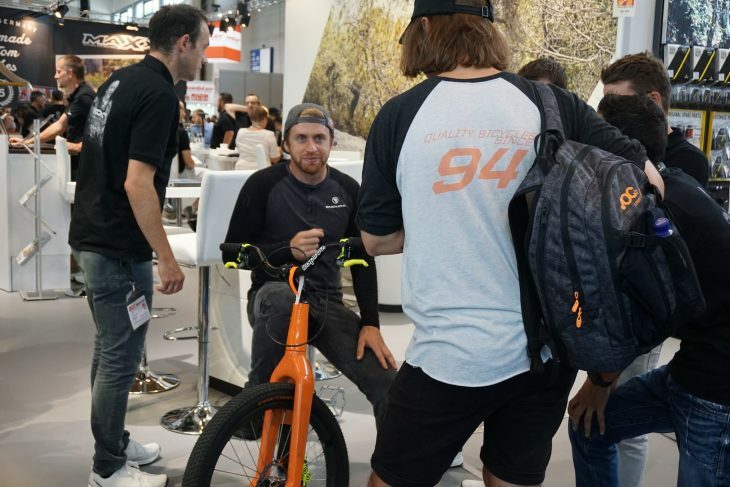 Magura really pushed the boat out for Eurobike 2018, unveiling not one or two new brakes, but seven new or updated disc brake solutions of all price points, oh and Danny Macaskill was hanging around from time to time also. 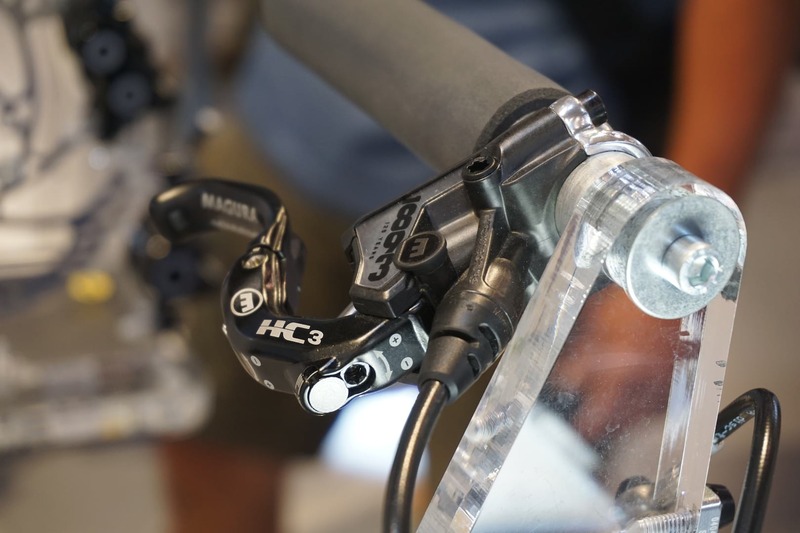 The big news for Magura as a company is that the hydraulic brake specialist is in its 125th year in business – how many cycling brands can match that – and to celebrate this momentous anniversary it has created a limited edition brake that’s already selling out fast. More details below. Limited edition Magura MT1893 levers. The MT1893 marks the 125th year of Magura and is named after the year the brand was first established, there will also only be 1893 pairs of the brake available and each one is individually numbered and ships in a lovely wooden crate. Each set of MT1893 comes in a gift box and a padlock with the code ‘1893’. The 4-piston caliper gets a polished finish and comes with a 12 set of optional colour covers so that you can match them to the colour scheme of your bike. 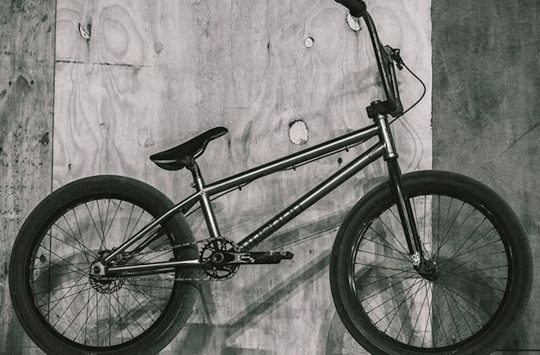 There’s also a one finger HC3 lever included which was originally developed for Danny Macaskill and features adjustments for leverage ratio, reach and lever angle too. 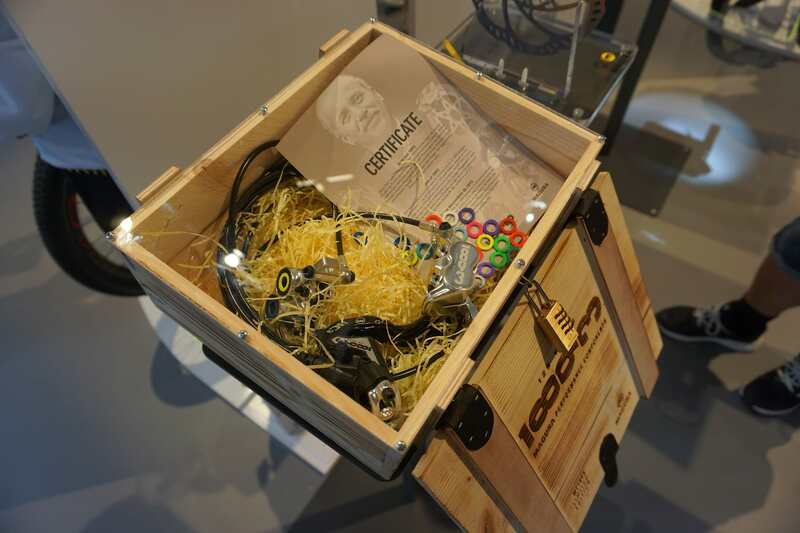 Magura has already seen a huge interest in the MT1893 with some fans buying them simply as a collector’s item with no intention of letting them see dirt! MT Trail SL designed as a lightweight trail brake with 4 pistons up front and 2 in the rear. Weight: 240g front. 220g rear. The MT Trail SL is Magura’s idea of a trail brake system and features a 4-piston caliper for front wheel braking while the rear is a 2-pot design. To keep weight to a minimum the MT Trail SL receives a new HC Carbon lever, again designed for one finger braking, but due to the lightweight design only has a reach adjust option via a 3mm Allen key. A new carbon lever helps to reduce weight. 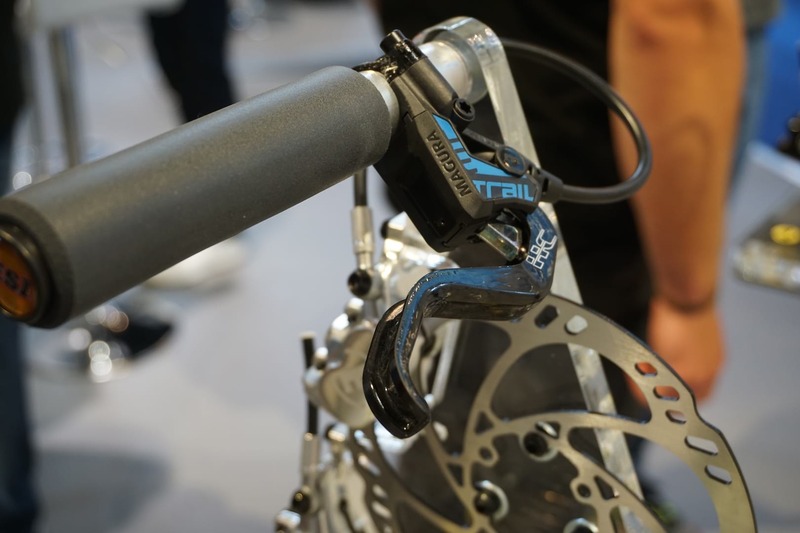 Magura has made the MT Trail SL easily identifiable on the trail with a highly polished caliper front and rear along with blue piston covers to match blue detailing on the lever. 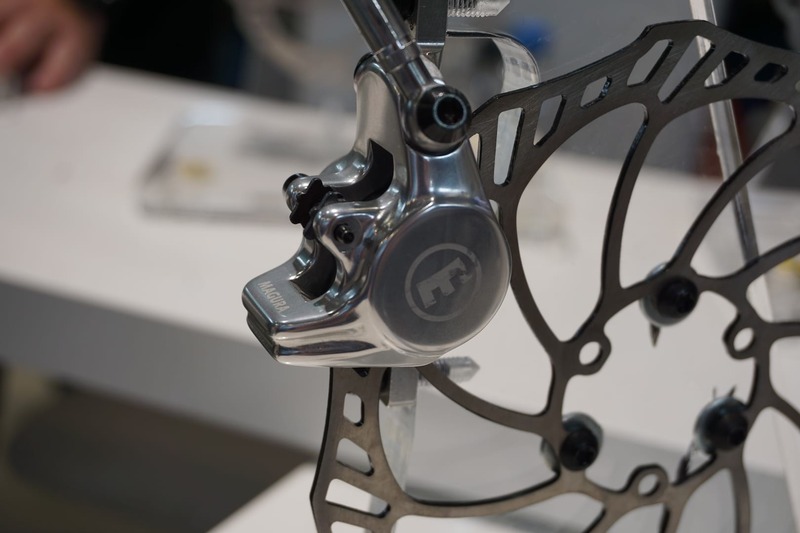 Another super lightweight disc brake system, but the MT8 SL is designed with cross country racing in mind rather than endless Alpine descents. 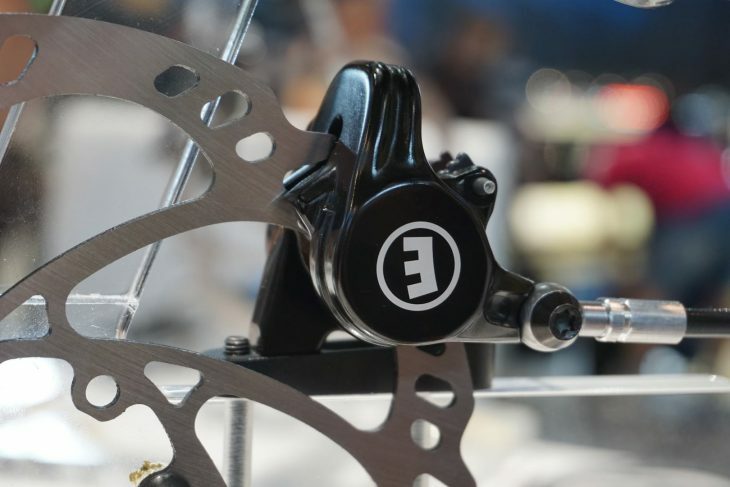 A 2-piston caliper design offers enough power for lightweight racers and their equally featherweight bikes, and also helps to keep the overall weight down to only 195g each end. 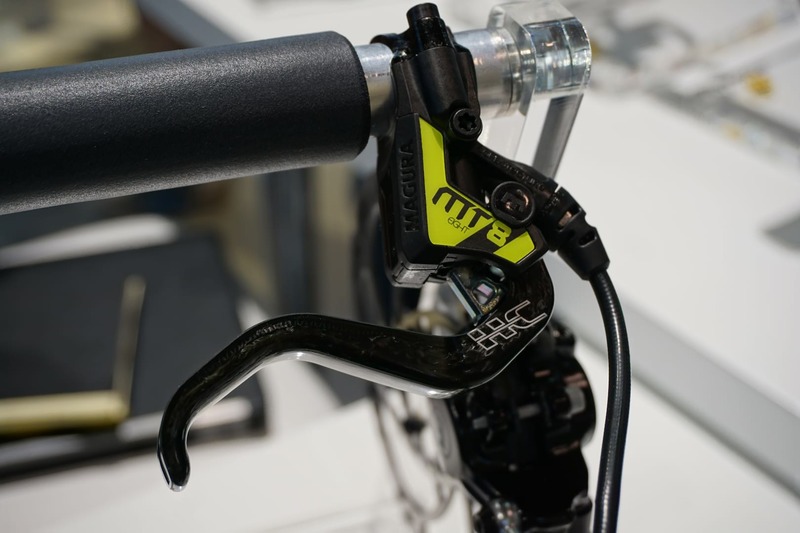 The same carbon fibre HC Carbon brake lever as the MT Trail SL is used on the MT8 SL, which is attached to a brake body with yellow details to match the covers on the calipers. 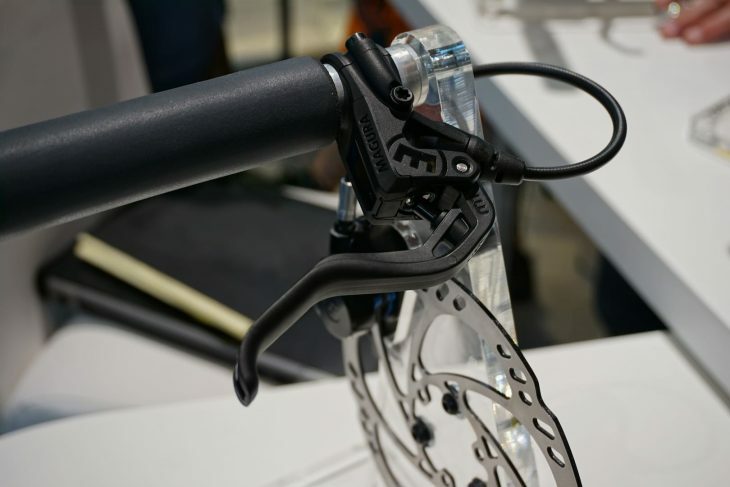 Magura MT8 Pro an affordable alternative to the MT8 SL. If you like the idea of the MT8 SL but aren’t really bothered about saving all that weight, Magura has the MT8 Pro. Not only does the MT8 Pro offer the same sort of braking power as the MT8 SL, but it also brings with it toolless lever reach adjustment too. The system comes with a polished 2-piston caliper and black lever body, but the best bit is the price. At £154 each, we reckon there will be a few of these on the trails in the coming year. 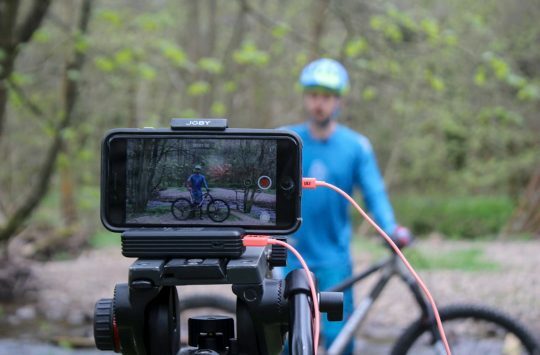 The Magura MT Sport replaces the MT2 and costs only £51.50 each! 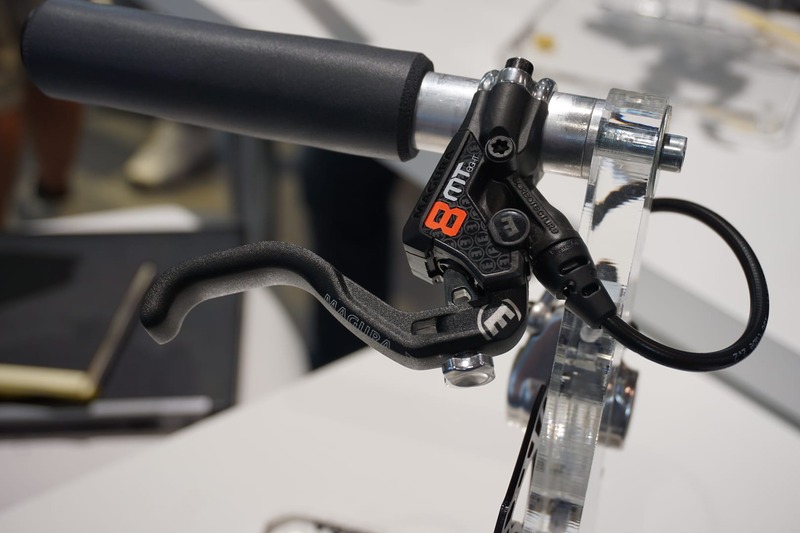 The Magura MT Sport replaces the older MT2 and gets a two finger Carbotecture lever and upgraded brake hosing to match the rest of the Magura range. 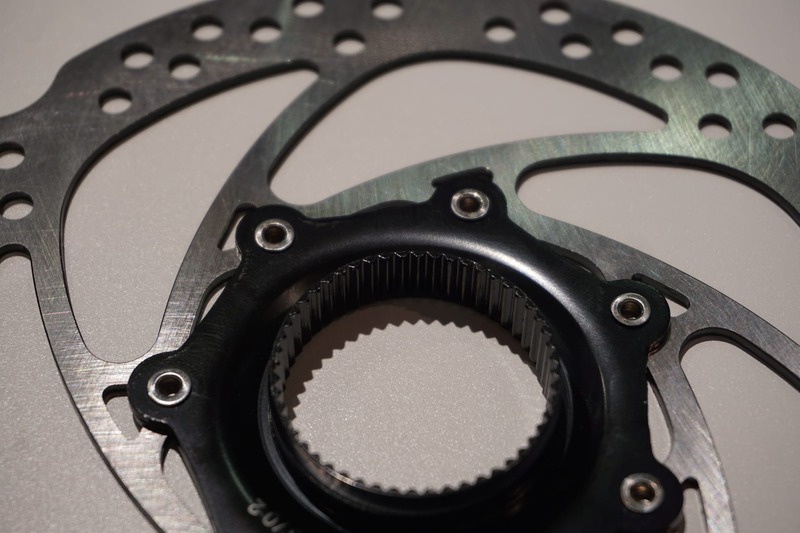 The 2-piston brake should be popular with bike manufacturers and shops, as the retail price is an incredible £51.50 an end! Flat mount brakes are compact calipers designed to save weight and are usually found on cross-country bikes. 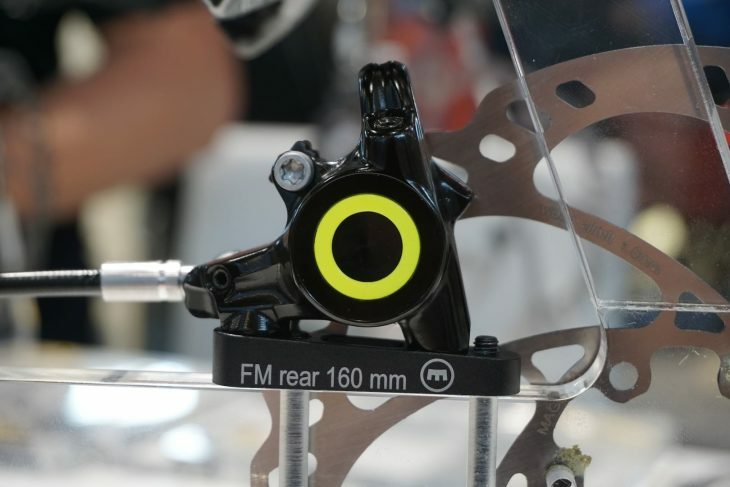 The Magura MT8 SL Flatmount is basically the standard MT8 SL brake but with this new compact caliper design that’s limited to 160mm rotors. What makes the Magura design stand out though is the fact that both standard and Flatmount calipers use the same size brake pads. The rest of the features are the same as the regular MT8 SL, including the lightweight carbon lever and yellow detailing. Magura MT4 Flatmount for riders who need a compact caliper on a budget. 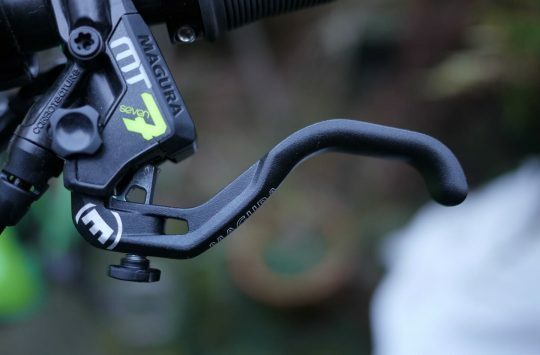 If the MT8 SL Flatmount is out of your price range then Magura offers the MT4. It’s not as lightweight but it offers the same full-size disc pad compatibility inside a compact design. Magura Storm CL Brake Disc. 2019 is also going to be the first year that Magura offers a centre lock brake disc for £30 and in 160, 180 and 203mm options. 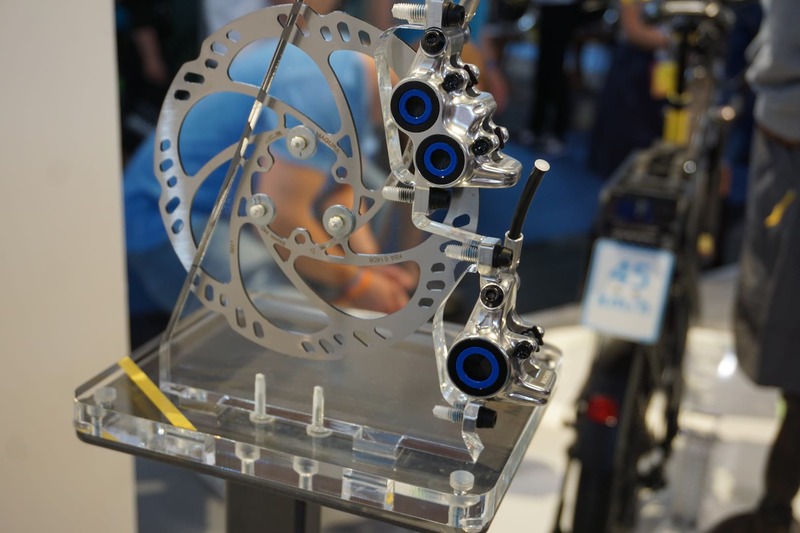 Interestingly we saw quite a few centre lock discs and hubs at Eurobike and we expect to see them more frequently as more brands choose to use them simply for speed of assembly and ease of fitting. And here’s a pic of Danny Mac looking at Andi with that “Who are you? and why are you taking my picture face?”. Luckily he wasn’t about when Hannah found his bike locked up and decided to probe his saddle!